For the past 17 years, Roberto Gaxiola has been in an exclusive relationship. But it has nothing to do with his social life. Gaxiola is a plant biologist at ASU’s School of Life Sciences, and he is committed to one single gene. But Gaxiola’s one and only is no ordinary gene. When its presence is increased in rice, corn, lettuce, barley, tomatoes, alfalfa and other plants, it works like a magic pill and could help solve the problem of food insecurity in the future. More than 795 million people on Earth suffer from chronic undernourishment. Researchers expect climate change to exacerbate the problem, as rising temperatures and changes in rainfall affect crop yields. One solution, Gaxiola said, is to create new plants that can thrive in these changing conditions. The gene Gaxiola works with, H+-PPase, is present in all plants and bacteria. He extracts the gene from a plant called Arabidopsis thaliana. The gene is very conserved, meaning it is very similar in all plants. Plants produce sugar through photosynthesis. The H+-PPase gene is instrumental in loading sugar into the plant’s pipes, or vascular tissue. These pipes distribute sugar throughout the plant so it can grow. Gaxiola’s research has shown that increasing the expression of H+-PPase makes plants bigger and more fruitful. To increase the expression of H+-PPase in a plant, Gaxiola first adds it to a type of bacteria. Then he lets the bacterium infect a plant. But instead of making the plant sick, this bacterium up-regulates H+-PPase, meaning the plant cells begin producing more of the gene. This is an example of genetic engineering. The transgenic plants that result have much more robust root systems, which makes them better at absorbing water and nutrients. A plant’s roots have the ability to acidify soil, which liberates nutrients like nitrate, phosphate and potassium. The roots gobble those nutrients up. However, acidification also liberates aluminum and iron, elements that can harm the plant if it takes in too much. When farmers acidify soil artificially, the process can go awry and the plants end up dying. But when plants liberate nutrients on their own, they also produce organic acids that bind to the harmful elements and keep them from intoxicating the plant. Since discovering in 2000 that up-regulating the H+-PPase gene has so many beneficial effects inArabidopsis, Gaxiola and his colleagues have tested it in several different types of plants. The results are striking. Gaxiola’s transgenic plants are drought and salt tolerant. They grow larger and produce more yield than control plants growing in the same low-water and high-salt conditions. That means fields with salty soil that are currently barren could be reclaimed for farming. As the global population grows, we’ll need to produce more food. But as climate change affects weather patterns, that may become more difficult. Gaxiola hopes transgenic plants can be part of the solution. "We have to face a crisis, feeding the everyday healthier and longer-living society, and also feeding societies that now have increased economic power," Gaxiola said. "Transgenic plants are not a magic bullet, but they are one step among a lot of steps that we now have available." ASU biologist Roberto Gaxiola tweaks plants to grow larger by increasing the presence of a gene called H+-PPase. This process, called up-regulating, is a type of genetic engineering. The method has proven effective in rice, corn, lettuce, barley, tomatoes, alfalfa and other plants. Here, Gaxiola compares the roots of two control tomato plants with a transgenic tomato plant under low phosphorus soil conditions. However, there are barriers to getting transgenic plants implemented mainstream. For example, Gaxiola tried to bring his modified lettuce to Salinas Valley, California, which is known as “the Salad Bowl of the World.” Farmers there are using fertilizer that contains more nitrate than plants can absorb. The excess ends up washed into the ocean where it disrupts fisheries. In other words, boosting one food source is damaging another. The transgenic plants, with their improved ability to absorb nitrate, would solve this problem. But the California farmers won’t use them. Why? The Salinas Valley farmers still refused. They said their main buyer wouldn’t purchase transgenic plants. “Who’s the buyer?” Gaxiola asked. This incident illustrates a larger, ongoing societal debate about genetically modified organisms (GMOs). Some people fear that GMOs are a threat to human health. Gaxiola explains that his transgenic plants are completely innocuous to humans because he is not introducing any foreign genes into the crops. H+-PPase is present in all plants. Gaxiola simply modifies the plant so it produces more of the gene product. The scientific community generally agrees that GMOs are safe to eat. But there are other reasons why consumers oppose their use. One major concern is that GMOs could harm the environment. For example, plants that are engineered to tolerate pesticides can lead to increased pesticide use. But the issue isn’t black and white — Gaxiola notes that GMOs can also offer environmental benefits. For example, his transgenic lettuce would allow farmers to use less fertilizer, which would result in less chemical runoff into the ocean. There are other reasons why consumers oppose GMOs, as well. The issue is complex, and as with any new technology, society must grapple with how best to regulate its use. Some European countries have banned all cultivation of genetically modified crops, while other countries are using them widely. When Gaxiola up-regulates the H+-PPase gene in rice, the plant develops a more robust root system and grows larger overall. Here, a control rice plant is compared with its transgenic counterpart. Effective GMO policies need to be informed by research. However, Eric Welch, director of ASU’s Center for Science, Technology and Environmental Policy Studies, found that scientists face barriers to getting biological materials they need for research. For his work, Gaxiola needs access to the H+-PPase gene. Fortunately, it’s readily available to anyone who wants to tinker with it. But other genetic material can be trickier to procure. In some cases, that’s due to regulations that deter biropiracy. Biopiracy is the act of profiting from biological resources and indigenous knowledge without compensating the people or community where they originated. For example, imagine you are a scientist working for a multinational seed corporation. You take a vacation to a small, developing country in South America. While there, you visit local farms and find crops you haven’t seen before. The locals explain that these plants can flourish with very little water. You bring back samples of the plant, take them to your lab and isolate a useful gene. Your company patents the gene, commercializes a new plant and makes millions, while the locals who showed you the plant never see a dime. Biopiracy regulations are in place to prevent scenarios like this from happening. “They are there for biosecurity reasons or equity reasons or other types of common access and pooling reasons,” Welch said. However, such regulations can also make it difficult for scientists to access germ plasms, like seeds or plant tissues, that are necessary for developing new plants that could benefit everyone. In a recent study, Welch surveyed scientists who use genetic materials in their research. He found that 96 percent have encountered some sort of genetic resource policy or regulation. This can result in delays or obstructions to their work, which could have implications for future food security. Welch said that regulations are in place for good reason. But they need to be implemented thoughtfully. “Adding one more regulation, and another, and another just creates a mess,” he said. Our food future depends on producing enough to nourish a growing population, sustaining the environment it comes from and protecting human rights in the process. It is a multifaceted issue that requires thoughtful policy based on scientific evidence and informed input from citizens. Get involved and learn more about food and other sustainability challenges through ASU’s Earth Month events. USPCAS-E is a partnership between ASU and two leading Pakistani universities: the National University of Science and Technology Islamabad and the University of Engineering and Technology in Peshawar. Funded through the U.S. Agency for International Development, the program is designed to find innovative solutions to Pakistan’s energy challenges. 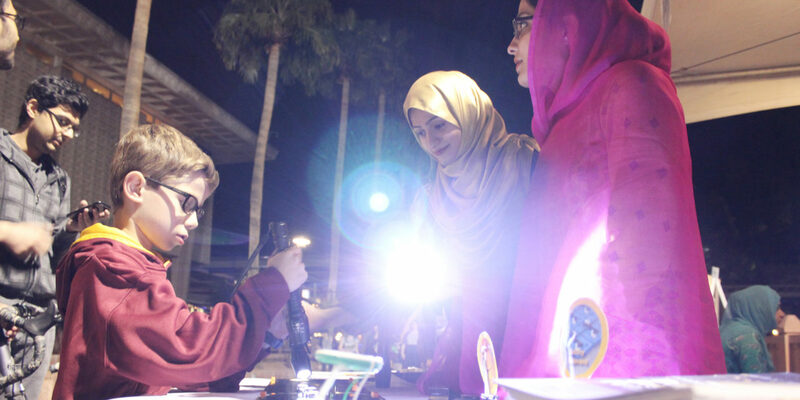 The group of students, comprised of 18 men and 11 women, represents the third cohort to spend a semester at ASU before returning to Pakistan to complete their master's degrees. “Physics is about making theories,” said Ussama Khalid Barki, who holds a physics degree from NUST. “Engineering is about execution.” Noting that his country is struggling, Barki said it’s time for action, not theories. Barki is now pursuing a master’s degree in energy systems engineering with an interest in developing technologies for rechargeable, solar powered batteries, but said he is inspired by energy researchers at ASU. He says he would like to continue conferring with ASU faculty once he returns home and work toward his doctorate. Actually, marketplaces of all sorts are of interest to the students. “We love shopping,” said Zahara, who says she’s particularly enjoyed Arizona Mills and Tempe Marketplace — both accessible via public transportation.